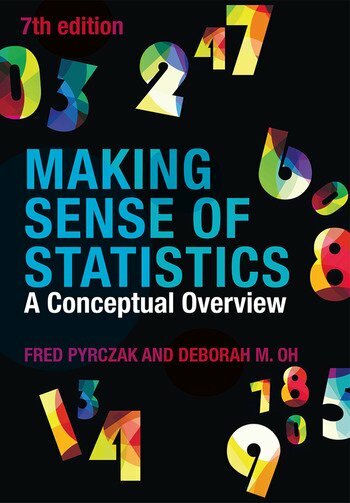 Making Sense of Statistics is the ideal introduction to the concepts of descriptive and inferential statistics for students undertaking their first research project. It presents each statistical concept in a series of short steps, then uses worked examples and exercises to enable students to apply their own learning. It focuses on presenting the why as well as the how of statistical concepts, rather than computations and formulae, so is suitable for students from all disciplines regardless of mathematical background. Only statistical techniques that are almost universally included in introductory statistics courses, and widely reported in journals, have been included. Once students understand and feel comfortable with the statistics that meet these criteria, they should find it easy to master additional statistical concepts. the inclusion of introductions to the book, and each Part. section objectives listed at the beginning of each section to guide the reader. expanded Appendices include a brief reference list of some common computational formulas and examples. a Glossary of key terms has been added at the end of the book, with references to sections in parenthesis. Dr Deborah M. Oh is professor in Research Methods and Statistics at California State University, Los Angeles since 1998. She earned her PhD from Columbia University, New York and teaches statistics to a diverse student population in both undergraduate and graduate levels.